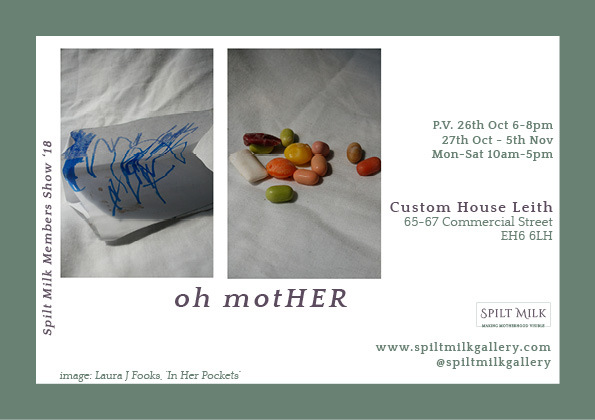 ‘oh motHER’ (Spilt Milk Members show ‘18) will be the first visual arts exhibition in Scotland solely dedicated to the work of artists who are mothers. The exhibition will present the work of both national and international artists working in photography, sculpture, installation, textiles and new media. The exhibition will be supported by a programme of participatory activity and drop-in workshops which aim to encourage local mothers and their families to engage with the exhibition’s themes which include maternal mental health, the mother-child relationship, emotional labour, breastfeeding and domestic ambivalence. With several recent studies highlighting the extent of the gender inequality in the creative industries and the ‘motherhood penalty’ playing a large role in the gender pay gap in the UK, mothers face a number of barriers in accessing and developing a career in the visual arts. Not only do childcare, financial and cultural barriers hinder the career progression of mother-artists, but artwork which focuses of the role of motherhood, reproduction and care-taking has regularly been dismissed and devalued within the contemporary arts. While the old ‘pram in the hallway’ debate lives on, ‘oh motHER’ aims to highlight the diversity of work being made by mother artists worldwide. The exhibition touches on themes including maternal mental health, the mother-child relationship, emotional labour, breastfeeding and maternal ambivalence. Performance of ‘(M)other’ by Lauren Montgomery on the opening night.